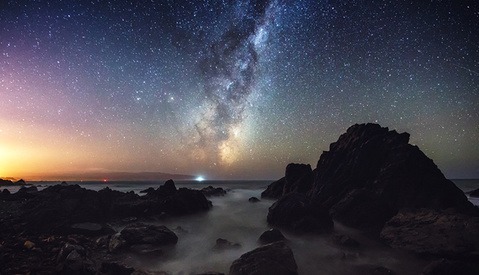 To say that time-lapse video and drone footage is everywhere would be an understatement. YouTube is chalk full of amateur aerial video with the recent abundance of inexpensive drones, and time-lapse clips are everywhere. If they are a fad remains to be seen but sometimes we get to see some really innovative videos showcasing some true creativity. 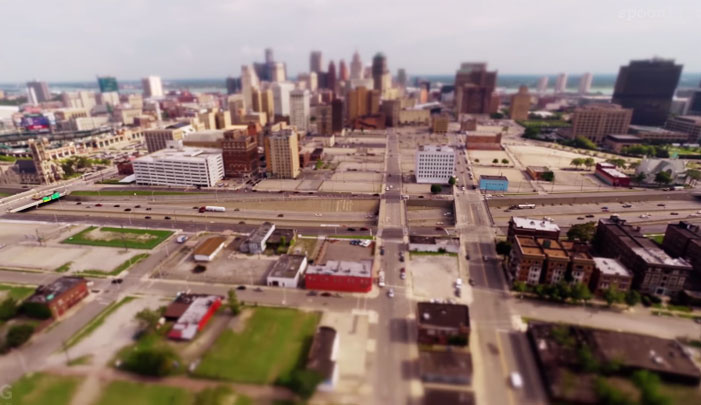 The creative minds over at Little Big World posted a new time-lapse video flying around Detroit. 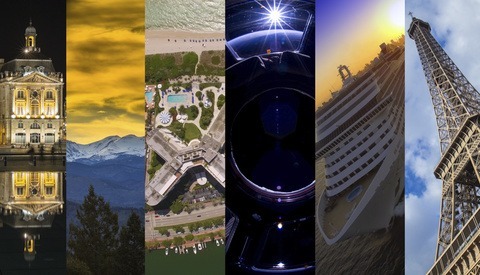 But instead of just your run-of-the-mill time-lapse video filled with beautiful cityscapes, this film takes it further, incorporating the use of a drone and tilt-shift lenses. The result is a tour through Detroit that makes the recovering city look like busting train set inside Mr. Rodger's Neighborhood. The film was shot throughout Detroit including the Michigan Theater, Packard Plant, Michigan Central Station, Lee Plaza Hotel, around the Masonic Temple and the Heidelberg Project, and many other abandoned buildings and locations around Downtown. The filmmaker, Joerg Daiber, used both a Lumix GH2 and GH4, 14-140mm and 7-14mm Lumix lenses to capture the beautiful decay of the city. This isn't the first film made by Little Big World featuring a major U.S. city. A few months prior, Diaber gave Chicago the same time lapse, tilt-shift treatment featured in the video below. With all the FAA and privacy debates going on about drones, will videos like this soon become impossible to create? 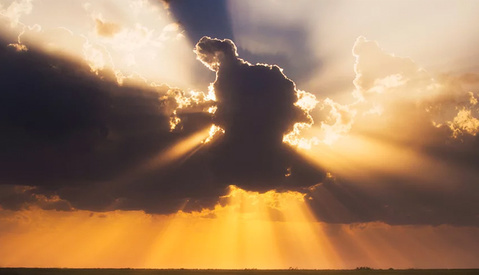 Our skies are yet to be infested with buzzing drones carrying expensive and powerful camera equipment, but the day might soon be coming when our creativity gets grounded. "...Makes Detroit Look Amazing." Not quite. These are beautiful images of Detroit, a burned out husk of a once-great city. The images look amazing. Detroit, not so much. I think they're still shedding their old skin but there are definitely places in Detroit that are picking up. Have you ever been too Detroit? Detroit is stunning, yea theres a lot of blight and open land where houses used to be but its still a great city full of people trying to keep it great and make it greater. I live across the river from this place... it's really not amazing whatsoever. it's actually really freekin dangerous still. Who finds babies in dumpsters? Detroit does -- that's who. I'd invite you to come over and visit me in the city and I can show you how amazing and how even though there is still crime problems its not as dangerous as most people lead on. Honestly when most people come over or visit they get freaked out not because its bad but because its really the first time you really have ever seen a Vacant city. Its still a major city covering 143 miles with only 700,000 people living in its limits. 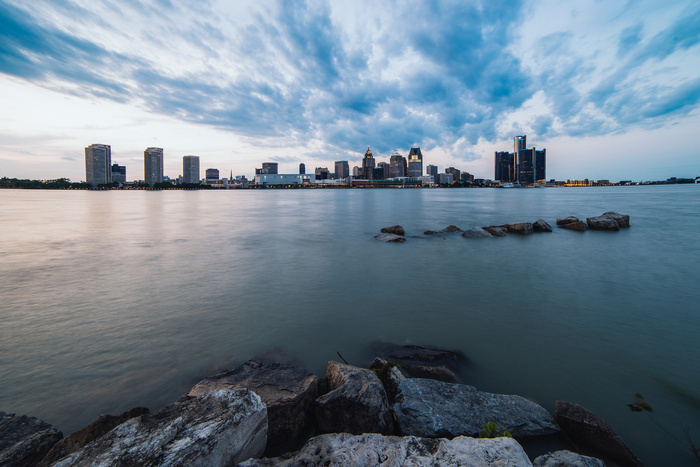 I also live across the river, in Windsor, and I do go across quite frequently and do find that Detroit is awesome - visually, culturally and entertainment wise to name a few. Yes it can be dangerous in the wrong parts at the wrong time just like any major city. I wouldn't just dismiss it. It really has come such a long way and it's becoming a pretty trendy and current place. On the flip side, yes I just visit and at the end of the day go back across the border and for the most part look at Detroit. The lenses listed are not tilt-shift lenses. In fact, looking at some of the footage, it appears to be a constant tilt-shift effect applied to images in post as the blur doesn't appear to follow actual depth but rather is just a gradient at the top and bottom of the frame. I think this "miniature" effect is getting tired, like HDR done poorly. The use of a drone to do time-lapse and good cinematography/editing alone are enough to make this video compelling,without the distraction of a cutesy effect.